Learning how to build a grape arbor can be a challenge, but how much of a challenge depends on the complexity of the arbor you select. Even something simple will add beauty and function to your garden if you are growing grapes. Building a grape arbor does not have to be complex. In fact, as long as you provide your grapes with some type of structure to climb, they are likely to do well. It is important the structure is high enough and sturdy, as grape vines can become heavy over time, leading to a collapse of less than strong trellis designs. To begin your project, work through the following process. Be sure to map out your plans before moving on. Choose the right wood: You need wood treated for the outdoors. A grape arbor will last for years, if you select the right type of wood to create it. Cedar is a good option because it is more resistant to mildew and rotting even in harsher weather. It is also easy to shape and strong but lightweight. Pick a sunny spot: Grapes like to be in full sun but you also want to select an area that adds to the look of your garden. An arbor can be a large addition to your home's landscaping. You also want to ensure there is enough quality soil and good drainage available. Lay out poles: It is important to lay out the locations of the poles. They are the framework for the arbor and should be strong, thick material. The more you put in, the larger the arbor will be, but you do not want poles spaced out more than six feet in most circumstances. Dig holes: Dig holes for each pole. Place the poles into the holes and ensure they are level. Then, place concrete surrounding the base of each one. Allow them to set before moving on. Choose a lattice: You can create your own lattice design for the top of the arbor or purchase a premade product from your lumberyard. The key is to choose the type of framework needed for the type of grapes you have selected. The lattice work should be secured to each of the poles through nails or bolts. Michael James provides a series of YouTube videos that can help you to learn more about building a trellis, including step by step design help. He provides several options for you to choose from including low and high trellis systems. The WoodWrokersWorkshop.com offers a number of free plans you can download and use to create a grape arbor or trellis. Do take the time to consider a variety of them until you find the one that works the best for your grape growing needs. 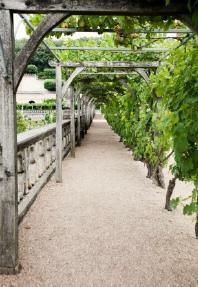 HGTV.com offers a detailed, step by step explanation of how to build a grape arbor at their website. Most individuals with basic home improvement skills can build this impressive design within a few days. If you are unsure if you want to take on the project of building your own arbor from scratch, do talk to local builders for aid. In addition, some home improvement centers may offer premade products you can purchase and use as a grape arbor. Look for any type of garden arbor, but be sure it will work well for the type of grapes you have selected to plant.